[UPDATE: 7/20/2015] You asked for it and you got it! We’ve added a Planned Date column on the VS Feature Timeline that will share quarter-year or half-year timeframes. Of course, these are subject to change but once we know the timeframe that a feature will ship in, you’ll know. Over the past few years, Visual Studio has been shipping products on a quicker cadence to ensure our customers have the best and most up-to-date tools in the industry. As part of this, we have been working to be more and more transparent to help you understand what we’re working on and show you how truly valuable your feedback is to the quality of our products. We generally share our plans with you via blogs or various feedback channels, like User Voice. Now we’re extending this transparency in an easy to consume format, to share some stuff we have in the works that we think you’ll be interested in. 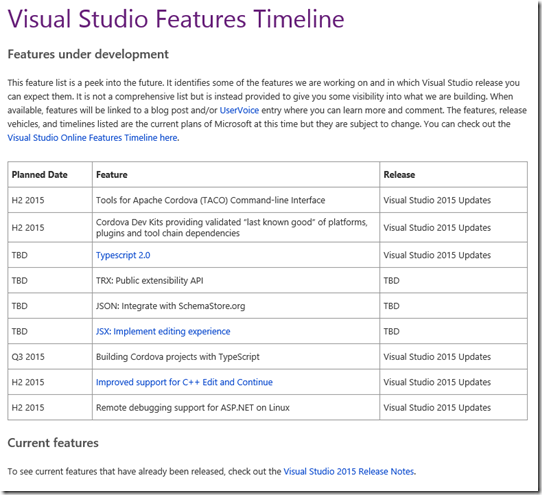 Starting today, Visual Studio is happy to share a feature timeline with you. 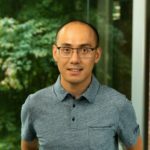 As Brian announced a few months ago in his blog post A new Visual Studio Online and Team Foundation Server Features Timeline, the Visual Studio Online and Team Foundation Server teams have started doing this as well. We’ve gotten a really positive response from you and have decided to open this up across Visual Studio to share upcoming features we’re working on in the VS client. The Visual Studio Feature Timeline gives a glimpse into what’s coming in future releases. Many of these items were pulled from your suggestions via UserVoice, as well as things we’ve shared in previous blogs and conferences. * Please note, this is a screenshot of the timeline taken at the time of this post. This will change over time so please checkout Visual Studio Feature Timeline on VisualStudio.com to see the latest timeline. You won’t see dates on this timeline but you will see which VS release train we expect various languages and features to be part of. Of course, as we move on with future updates and major releases, you’ll start seeing us share features tied to these releases, as well. When we aren’t sure what release the in progress features will be in, we’ll list them as TBD. As with the VSO Timeline, some stuff may get cancelled or change along the way and we’ll do our best to communicate that to you as soon as possible. As always, your feedback helps us do better and we’d love to hear what you think in the comments. Megan Yount has been at Microsoft for 3 years, working as a release manager to get awesome Visual Studio products into the hands of eager developers. She’s currently working on the customer and feedback team where she’s focused on making the latest, greatest Visual Studio products and content easy to find, understand, and download.